For those who want to believe (hello TechCrunch) that Google+ is going away: think again! Here’s a very clear indication that Google+ is continuing to gain traction in the Google ecosystem. Google+ is continuing to add features and Google search will soon reward users of Hangouts and YouTube Live Events with more prominent search placement. The latest: a new feature is rolling out that rewards those who master the use of Google+ Hangouts on Air and live event planning via a connected YouTube channel with higher search results. That means that the planet’s two largest search engines, Google and YouTube, will highlight content created in Google+. Google is creating searchable listing guides for Google+ Hangouts and YouTube Live Events and connecting them with Google search. That prominent search placement won’t be a paid feature. It’ll be a semantic search result, generated from Google+ Hangouts connected to YouTube Channels. It’ll show up in search results approximately three hours before a scheduled live event. Before then, the events will be listed on both Google+ and YouTube’s new directories. 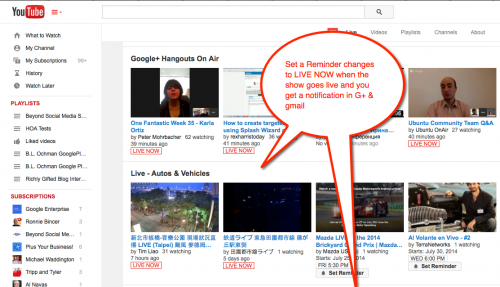 1- Hangouts on Air schedule/directory for Google+ members who want to watch on Google+ event pages or on YouTube. If you have a gmail account you can participate live in a Hangout during the event via the Event Page by either joining the Hangout as an invited guest, or by asking questions in real time via Comment Tracker while the event is live. You also can watch a Hangout on YouTube from your desktop or any mobile device without having a gmail account or Google+ profile. 2. A YouTube live-streamed event directory with listings in categories for upcoming live-streamed events in Sports, News, Politics, Music, etc. as well as for Hangouts on Air. *	It shows events that are currently live and ones that are scheduled. You can set a reminder for the upcoming Hangouts and you’ll get an email reminder as well as a notification in your Google+ account. 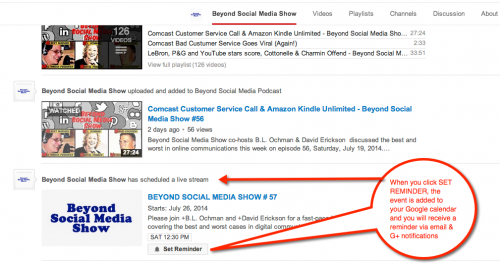 Here’s how this works with The Beyond Social Media Show that I co-host every Saturday at 12:30 pm EDT on Google+. *	We set up an event page in Google+ several days before the show. *	We include a description and a preview video, which is created in and linked to our YouTube channel. *	We send out invitations to the Circles of people who follow us and they respond Yes, No or Maybe to the invitation. If they say Yes or Maybe, our Show is automatically added to their Google calendar. They will be reminded about the event via email, Google+ notifications and their Calendar. *	At the time of the event, they can watch live on the event page or on our YouTube channel. * The video that is part of the event is listed on our YouTube channel as a scheduled event and viewers have the option of setting a reminder that will notify them of the event as described above. 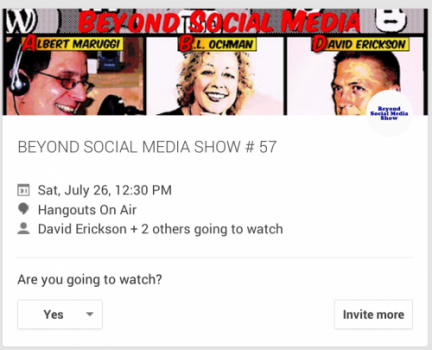 When I set up the Google+ event page for the weekly Hangout on Air broadcast of The Beyond Social Media Show, I include search tags and search optimized content and title, all of which are featured our YouTube channel. People who say “yes” or “maybe” to our show invites are reminded to watch, and can see it within Google+ or on YouTube. *	You will still need a Google+ Profile to set up live events that include Hangouts that can be watched within G+ event pages or communities. Is there a learning curve? You bet! And if you’re ready to learn, I can teach you how. You can reach me at 917-566-5855 to schedule a free 30-minute consultation.